Science has been telling us for years (ya know, because me and science are tight) how important it is to eat a good breakfast in the morning, but for a lot of people that’s difficult for a number of reasons. A major one being that you just don’t have the time, period. When I was pregnant with my first baby, my doctor told me in order to curb the rapid weigh-gain I was experiencing, I needed to replace my standard breakfast of fruit and yogurt (I was trying to be so good! ), with something protein-rich likes eggs and bacon or sausage. Seriously? (I think that was actually my exact response) While I really didn’t mind cooking in the mornings, I was working full-time at a job that required me to wake up at an insane hour (4:30am!) and there was noooo way I was going to be whipping up an omelet before heading out the door. I needed something I could grab and go, and then heat up like 4 or 5 hours later when the normal people of the world were eating breakfast. I toyed around with breakfast casseroles that I could cut up and freeze, but those were far from healthy. So I came up with a little egg/cheese/veggie mixture that I baked in muffin tins. It was lean, protein rich, and included some vegetables which I otherwise wouldn’t be eating in the morning hours. It worked so great. I just kept them in a container in my fridge, or even froze them, and grabbed one as I headed out the door. These are great for kids in the mornings, or to take to work, or just to have at home for breakfast or a healthy snack. And my new favorite variation is to bake them in a little ham cup instead of a cupcake liner. It adds protein, flavor, and heck it just looks fun. This is the combo I’ve been making lately, but these are so flexible. You can switch up everything. I really love them with bacon (isn’t everything better with bacon? ), and they’re awesome with red peppers, green chilis, and pepper jack cheese. Play around with everything from the cheese to the add-ins to the egg-ratio, and find a combo you like. If you come up with a good one, come back and share! Couldn’t be easier. Just combine all the ingredients and whisk together. I’ve found that even with greased, these stick horribly to the muffin pan so I like to use foil liners. You’ll need to remember to take them out of the liners before re-heating, but they work well for baking. Or as I mentioned, in place of a liner you can use a piece of thinly sliced ham. Even just the cheap stuff from the lunch meat section works great. 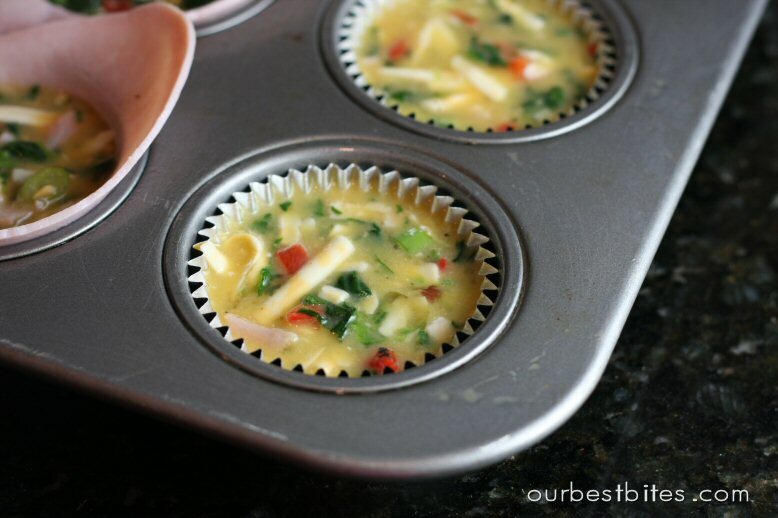 Just stuff it in the muffin tin and create a little bowl and then fill it with egg mixture. Bake them until they puff up nicely and are just barely set on top. Overcooked eggs are spongy and gross, so don’t go crazy and let them cook too long. As soon as they’re cool enough to handle, pop them out of the tin and eat! Or you can let cool completely to room temp and freeze and just reheat one at a time in the microwave. Store leftovers in the fridge. *1/4 egg substitute = 1 whole egg, so if you’re using all eggs, or some eggs and some egg whites, you can adjust accordingly. In a bowl, combine all ingredients (except ham slices) and stir well. 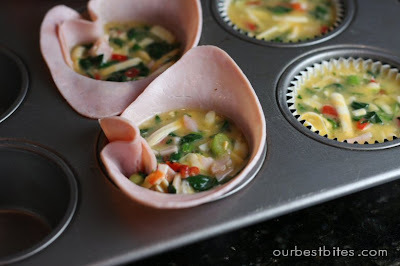 If using ham slices, spray muffin tin with non cook spray and place one piece of ham in each well to form a bowl. If using foil muffin liners, spray the insides of the liners with non-stick spray. Evenly divide egg mixture between the 12 muffin wells (about 1/4 C each), being careful to keep ingredients well dispersed. You want them to fill right up to the top. Place in the oven and bake for 15-20 minutes. The tops should be puffed and just barely set on top. Eggs will sink after cooling. Store them in an airtight container in the fridge, or freeze them. When reheating in the microwave, make sure to take off the foil liner! And if you’re reheating from frozen, I try to take them out the night before so they can thaw in the fridge. Then when you microwave them, set them on a folded paper towel to drain excess moisture. Eat them alone, or for a well-rounded breakfast crumble on top of a piece of whole grain toast along with a glass of milk and a piece of fruit. Makes 12. YUM!!! I have the hardest time fitting breakfast in because of early morning classes. I usually just eat when I get home. These might change that- they sound wonderful! I’ve made a variation of these before and loved them but your recipe sounds so much easier and healthy. I’ll be trying them very soon as I’ve had about enough of the cold cereal monotony. Great idea! I am going to be trying this since i am on WW. Love it! My weight loss program consists of a high protein low carb diet and I’m SO excited to try these. I’m not sure my kids will eat ’em up like my hubby and I will but it’s sure worth a shot. Thank you! Anything with “quiche” in the name is my friend. Kate- I’ve done them without liners too, but even with a good spray the pan is always a beast to clean, so that’s why I always use liners! Yum! I love these. I usually put chopped asparagus in them. I like a little crunch and I hate bacon. Yeah, it’s true. Oh how yummy sounding!!!! I have never seen anything like this before! i LOVE this idea!!! and i am always looking for something for breakfast because I have to get up at 4am.. yes 4! Thanks for sharing this!! This is a really great idea! You guys come up with the best stuff! AND, they look delicious to boot! 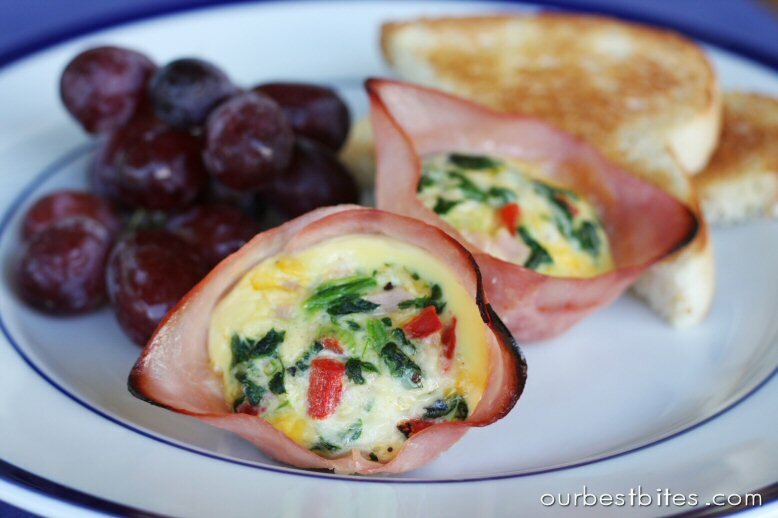 One of my goals is to eat better at breakfast – these look like a perfect solution!! Thanks! I just had my second baby and it is hard to find time to eat, especially in the morning. I think I will whip up a batch of these and hopefully my toddler will like to eat these too. I eat eggs pretty much every single day, but only because I’m diabetic and anything else does bad things to my blood sugar. If I could eat what I wanted, there’d be a lot more oatmeal, french toast, pancakes, and such in my mornings. Could one use fresh spinach instead of the frozen? Another thing to add to my list to try. You two are too amazing. I bet fresh spinach is just fine. I always mean to try it, and then I don’t have any when I decide to make them! You may get some excess moisture from fresh spinach, so that would be the only thing, but my guess is that it’s just fine. I add fresh spinach to regular eggs all the time. If you try it, come back and let us know how it goes! Yummy! What I really want to know though, is how do you have such a clean muffin pan? I have been pondering how my muffin pan is so yucky and wondering if there is a secret pan to buy??? haha, mine is clean because it’s pretty new! Crystal, I would probably saute the spinach first, just in a little non-stick cooking spray; that way, you could squeeze out any excess moisture. I just made these and they were really good. My son who is 2 years old ate one too. Thanks for the idea. I love this recipe. I made it for the third time today. I am not a huge egg fan, but these turned out delicious… I made adjustments to the ingredients with things I love… adding oregeno, garlic salt, mushrooms and canadian bacon… I'm excited for breakfast this week, but they might not last the night. I know this is an old post and a silly question, but how long do you microwave these for? Thanks! Not a silly question at all Mary! It really depends on your microwave, but I do it for about 30 seconds and they're perfect. I'm supposed to bring the "protein" dish to a baby shower brunch I'm going to on Saturday. Would these be pretty enough to bring? I like that they are easier to serve than slicing up a quiche. What do you think? My sister is going to make these for a baby shower tomorrow and we were trying to figure out the egg combo. Do you need 4 eggs OR 1/4 egg substitute? I've never cooked with egg substitute but they seem to be the same. these are FABU. i tried them today– sauteed red peppers, onions, zucchini, and broccoli first and let it cool, then stirred it into the egg/egg substitute mixture with the spinach and some feta cheese. i didn't have any cottage cheese, so i left that out… i'm so excited to try them reheated– I LOVE YOUR SITE!!!! These are delicious! However, when I gave my mother the recipe, she apparently didn't read the part about NOT using the foil cups for baking and can't get the egg remnants out of her muffin pan. Any suggestions? MDtripmom- I think soaking and scrubbing is the only solution! I totally love the ham cups! They will add the perfect touch to these. My kids will love these! 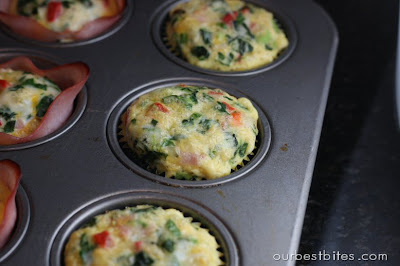 I baked these in silicone muffin tins (without greasing the pans, without using the metallic liners, or using ham)…..they turned out PERFECT! Didn't stick AT ALL. Just thought I'd share that. 🙂 Thanks for so much for this recipe! My family took them on a trip to Branson and had them for breakfast for as long as they lasted. Definitely something I'll make again for road trips. These were delicious! Can't wait to have them again! I'll be featuring this recipe on my blog – credit and linked back to you – this Wed. I baked these and they were delicious! But, I used the foil liners for the muffin tins and they came with the paper liner attached inside?? I used it as is, because that's how it came, but when they were baked and we ate them, the food stuck really bad to the paper part, even though I had sprayed it. Any suggestions? Should I separate the paper from foil? Why is it packaged like that if it's not supposed to be there? I followed links from your post at Make It & Love It… thank you for sharing this recipe! I'm in desperate need of some more quick and easy breakfasts I can make ahead and freeze, then grab as I'm heading out the door to daycare drop-offs and work. This looks perfect! These were soooo good!! Thank you for the wonderful recipe! I know this recipe is pretty old, but I just made these and I love them! My 2 year old and I go for a walk every morning as soon as he wakes up, before it gets too hot, and this is the perfect hand-held breakfast for him to eat in the stroller. Thanks for the recipe! My aunt told me about your website, we’ve tried your recipes, and now such a great idea like this! Thank you, these are perfect for my low-carb diet! My husband really like them too and they were easy for him to grab and eat as he went out the door to work. I made these two weeks ago and didn’t have red peppers and made some with ham cups and some without. I loved them both, but hubby preferred ham on the bottom. Today I didn’t have breakfast meat but roasted my own peppers (thanks for the tutorial!). They were just as tasty to me!!! I plan to make several batches to put in the freezer for busy mornings. Thanks for the great recipe!!! these look delicious! we’ve been looking for an on the go healthy breakfast option and i think these will be it! thanks! I just made and served these for Easter breakfast. They were a huge hit, although they did earn the nickname “Ham Cupcakes”! I love the ham cup idea!! Ive made these in the past and they do stick horribly to the pan no matter how much pam i used!! I usually made mine with broccoli, green peppers, onion and chopped up canadian bacon!! They are co yummy and filling!! oh, and I would eat mine with a little red taco sauce on the side to give it a little kick!! I know this post is a few years old, but I always have trouble with it. What sor of ham do you use that doesn’t break or split, that fits so nicely in the tin wells, and doesn’t do foldy-floppy things that take up the whole well and make it impossible to fill without spilling into the tin??? hmm, I dunno- I always just grab whatever they have at the grocery store that day! I like to make these in the foil cups, but instead of finely diced ham, canadian bacon, or crumbled bacon I like to use extra lean crumbled ground beef(cooked)and can diced green chilies instead of Bell Peppers( not a fan of bell family), but for Easter I’ll do the Ham cups. Has anyone try some mushrooms? Question if you use the slices ham for the cups, do you still put the finely diced ham, canadian bacon, or crumbled bacon? Sure! Totally up to you, these are very flexible. How long have you left these in the freezer? And how many days do leave them in the fridge. I am going to spend my two off days making freezer meals. Im always scared of spoiled food! Made these this morning with fresh spinach, bell pepper, green onions, and Canadian bacon. So yummy. I also made these in silicone cupcake liners and they plopped out perfectly no sticking at all. Question – I’m hoping to make these for a family reunion. Would it work to make the egg mixture with fresh veggies (I like making these with green onions, red peppers, and yellow peppers) at night and then bake them in the morning? Thanks! Yep, you can definitely do that. I would cut your veggies really small though, or preferably saute them a bit first so they aren’t too crunchy.